Edict of Expulsion by Maria Theresa. (1) The Jews may take interest at the rate of 5 pfennig in the mark, 6 pfennig in the pound, and 1 pfennig in 30. (2) When a Jew is plaintiff against a Christian, he must produce Christian as well as Jewish witnesses, and vice versa. (3) A Jew found with an unmarried Christian woman shall be sentenced to death. 4) A Jew found with a married Christian woman shall be impaled at the cross-roads. (5) Blood-stained garments may not be taken in pledge. (6) A Christian killing a Jew shall be sentenced to death. (7) A Jew taking an ecclesiastical vessel in pledge shall surrender it on demand without reimbursement. (8) A Jew called upon to take an oath in a lawsuit concerning a Christian shall swear by the Pentateuch. John "ohne Land," in 1336, sentenced several Jews to be burned at Prague on the accusation of having partaken of Christian blood; after this he had their synagogue torn down, where he is said to have found much money. Charles IV. confirmed (1356) the regulations of Ottocar. In 1361 he personally examined the notes held by the Jews against citizens of the Altstadt and canceled those which had not been paid; five years later he transferred the house of the Jew Lazarus, in the vicinity of the Church of St. Nicholas, to the university. Under Wenceslaus IV. an attack upon the ghetto occurred. Some children had thrown stones at the host which the clergy were carrying in procession on the day after Good Friday, whereupon the clergy, and especially Ješek Čtyrhranný, exhorted from the pulpit the people to take vengeance. The populace thereupon attacked the ghetto (April 18, 1389) and killed about 3,000 Jews. 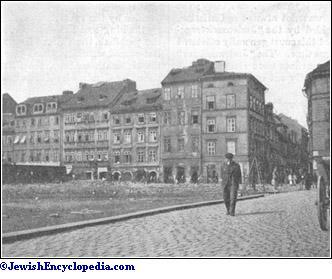 On Easter Monday following, Huler, one of the royal chamberlains, ordered that the Jews should be legally punished; accordingly five tons of silver were taken from them, and part of the ghetto was burned. Abigedor Ḳara's elegy , which is recited on the Day of Atonement, is a memorial of this persecution. In 1393 King Wenceslaus IV. renewed the regulations issued by Ottocar; in 1419 the Bohemian Diet decreed that a Jew could take in pledge only objects that had been officially inspected. During the Hussite wars the Jews of Prague sided with the followers of Huss and aided them in digging the moat at the Vyšchrad. When this was captured in 1421 the citizens plundered the ghetto. It was again despoiled in 1448, after Podiebrad captured Prague, and in 1483. At Podiebrad's request King Ladislaus (1440-57) issued several decrees relative to the Jews of Prague, which were based upon the so-called law of Sobêslai, dating from the time of the Hussite wars. During the king's sojourn at Prague, in 1497, he granted the Jews the privilege of lending money on landed property, and on notes of the burgraves of the city, at 20 per cent interest, "so as to enable them to support their wives and children." But two years afterward he forbade them to lend money on any notes whatever. Procession of Jews of Prague in Honor of the Birthday of Archduke Leopold, May 17, 1716. (From Schudt, "Jüdische Merckwürdigkeiten," 1717.)Persecutions. The council of the Neustadt determined, in 1503, not to admit any more Jews. The Jews therefore sent a messenger to King Ladislaus II. (1471-1516) at Budapest; but though they obtained permission to enter the city, their commercial activity was curtailed in that they were permitted only to take small articles in pledge, and as interest only three pfennig in the "schock"; further, they were permitted to barter only in the market, and were forbidden to peddle second-hand clothes. In 1507 the council of the Altstadt commanded the Jews to close their synagogue at once and leave the ghetto, because they had failed to pay punctually the yearly dues to the citizens of the Altstadt. The Jews again sent a messenger to King Ladislaus II., who permitted them to remain one year longer in the ghetto. In the meantime two Jews paid the interest to the bailies for Mikulašz Hořic.On St. Philip's day, in 1514, a demented Jew killed a Christian child with a stone; in punishment he was broken on the wheel at the foot of the gallows; only a heavy storm prevented the populace from falling upon the Jews. The question as to whether the Jews of the Altstadt were subjects of the king or of the town council, which had been in dispute for a long time, was finally decided in 1515: the Jews were to recognize the suzerainty of the king, while paying, at the same time, taxes into the municipal treasury. It was further decreed, in the same year, that if a Jew had made a loan on a mortgage, and the debtor brought the matter before the burgrave, if the Jew still insisted on being satisfied he should be compelled to leave the city immediately. The Jews were not allowed to take interest of more than two pfennig in the schock; they were not permitted to mix Silesian coin with Kuttenberg money; and they were compelled to wear the prescribed mantle and cap, on pain of a fine of two groschen. On March 11, 1518, the Jews of Prague agreed to pay fifty schock, Bohemian coin, to the burgrave in return for having their cemetery and bath protected. When Louis II., the last Polish king of Bohemia, entered the city (1522) the Jews met him in solemn procession, singing psalms, while the rabbi carried the scrolls of the Law under a silken canopy. When the Jews requested the king to touch the Torah, he complied, not with his hand, but with his whip; after which they offered him 100 ducats. On this occasion the king assigned all the taxes of the Jews to the citizen Lew of Prague, who in return agreed to protect them; and the king repealed the decree of expulsion which the "Kürschner Cardinal" had obtained the year before from the Bohemian Diet. On Feb. 5, 1527, the Jews, by command of the authorities, went to the gates of the ghetto to meet King Ferdinand, the "Jews' flag" being carried at the head of the procession, before the rabbi; the king promised to protect them in their religion and their rights. In 1539 the Jewish merchants were forbidden to display their wares in Ladislaus Hall, which was used as a conference-room by the Bohemian delegates to the Diet. In 1540 a Jew was caught smelting silver, and in consequence a second edict of expulsion was proposed and passed by the Diet in 1541. Fifteen Jewish families only were permitted to remain, down to 1543, in which year Ferdinand renewed their letters of convoy and issued fifteen others. In 1545 all Jews leaving the city received letters of convoy, at the request of the queen and of Sigismund of Poland. 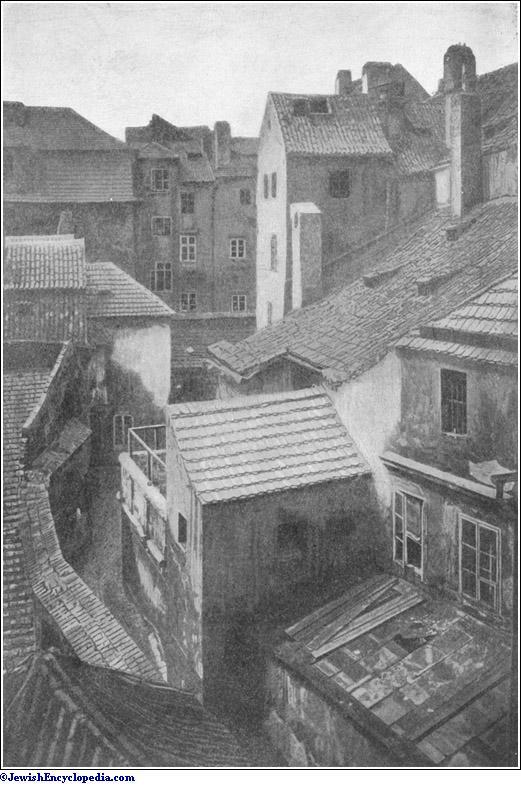 In 1557 seventy houses were burned in the ghetto of Prague, and in the same year Ferdinand swore that he would no longer suffer any Jews in Prague. Mordecai ben Ẓemaḥ Soncino thereupon went with a petition from the Jews to Pope Pius IV., who released the king from his oath. 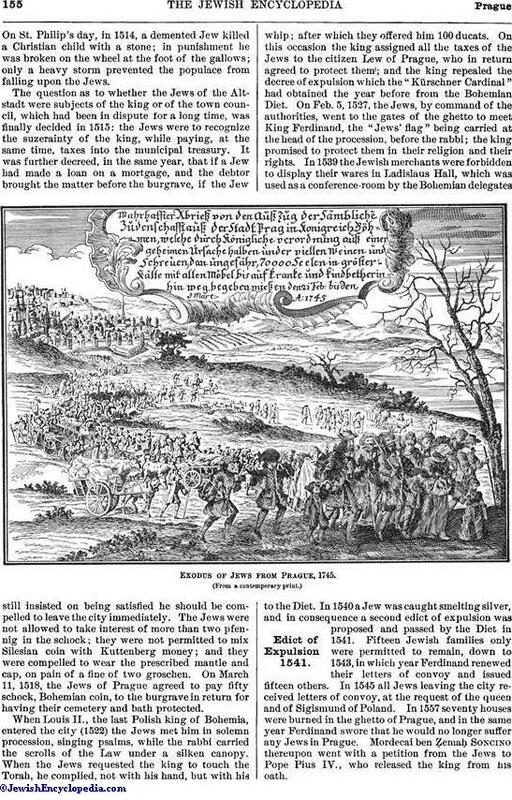 Exodus of Jews from Prague, 1745. In 1561 the king decreed that the Jews of Prague should once a week attend a Jesuit sermon in the Salvator-Kirche, and should send their children thither. In 1566 Maximilian decreed that the Jews should never again be expelled from Prague. When the emperor and empress went to the city, in 1571, they visited the ghetto, going on foot through many of its narrow streets, the Jews meeting them in solemn procession. In 1585 the Jews of Prague complained of the burgrave and the estates to Emperor Rudolph II., who shortly after ordered the burgrave to cease annoying the Jews. The intermediaries between the king and the Jews in the sixteenth century were Jacob Bassevi von Treuenberg and Mordecai Marcus Meisel. In 1621 Wallenstein commanded that no soldier should sell anything without the consent of his captain. 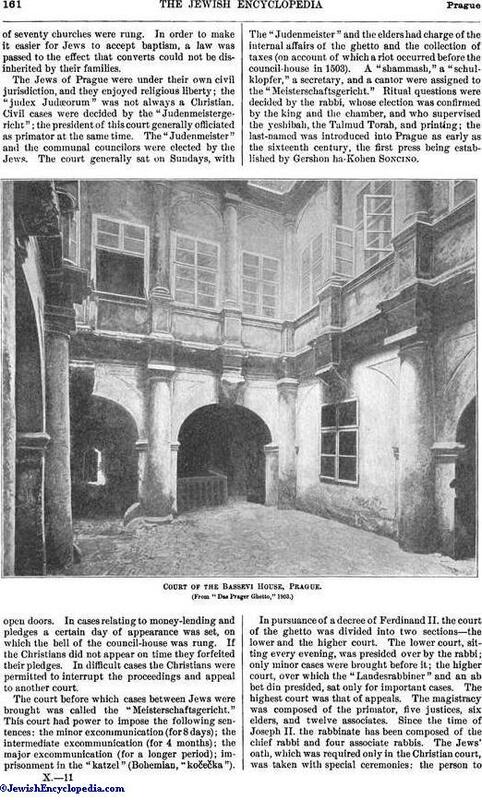 Shortly after (1623) a soldier stole some valuable curtains from the palace of Prince Lichtenstein, selling them to the Jew Jacob ben Jekuthiel Thein. 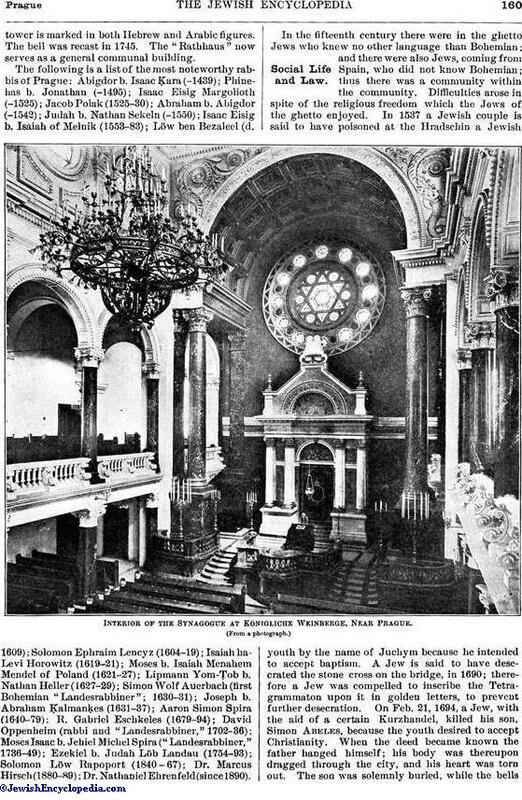 When the theft was announced in the synagogue Thein offered to restore the goods; but Wallenstein insisted on having the Jew punished, and the elders of the community had great trouble in obtaining his release. They were commanded to carry ten open bags of silver (11,000 florins) from the house of the citizen Šmiřicky to the town hall of the Altstadt in order that all persons might take cognizance of this punishment. During this time Thein, guarded by two dogs, sat under the gallows on the banks of the Moldau, before the house of the executioner. The money was to be deposited in the town hall in perpetual memory of the family of Wallenstein, the interest to be applied to the aid of Jewish and Christian young men studying Catholic theology (see Purim Fürhäng). Jewish Butcher of Prague, Eighteenth Century. Gild-Cup of the Jewish Shoe-makers of Prague, Eighteenth Century. The condition of the Jews of Prague became worse under Ferdinand III. New poll-and war-taxes were introduced in 1638, and in 1639 a tax for the maintenance of the army. In 1645 the Jews of the ghetto were ordered to furnish several hundred uniforms for the soldiers, but the latter were never quartered in the ghetto. In 1648 the Jews contributed 1,500 gulden to the defense of the city. There were in all 2,000 Jews in the ghetto in 1652, but their ranks were considerably thinned by the great plague of 1680. The ghetto was destroyed by fire on June 21, 1689; French incendiaries had started the fire near the Valentinkirche, and the flames spread over the entire ghetto within two hours; the ten massive synagogues were either burned to shells or reduced to ashes. One hundred Jews who had sought refuge in the synagogue near the cemetery were caught under the roof as it fell in. Some escaped with a part of their possessions to the banks of the Moldau, only to be plundered by Christians. The Jews found shelter among the Christians for the next three months; but the archbishop finally forbade them to accept such hospitality, on the ground that they derided the Christian religion; the Jews then removed to a place behind the Spitalthor. By order of the emperor the houses of the Jews were rebuilt of stone, this work being completed in 1702; the ghetto was then separated from the Altstadt by a wall which was carried down to the Moldau. The Altneuschule, Prague, from the West. In 1703 the Jewry received a new constitution and a new Jewish magistracy. The year 1735 was marked by the refusal of the Jews to pay their personal tax ("mekes"). During the wars between the empress Maria Theresa and Frederick the Great, 1740-44 and 1757, Prague was besieged by the French. After its capture those Jews who had been among the defenders were obliged to pay large sums as a war indemnity, and in spite of their friendly attitude toward the invaders they were cruelly treated. A Jewess in whose shop a Frenchlady had left 10 gulden was hanged in the Neustadt in 1742 ("Ḳobeẓ 'al Yad," viii. 13). After the departure of the French the Jews made their peace with Maria Theresa, through the intercession of the primator Frankel; for the Jews were reproached with having assisted officially at the coronation of the Bavarian elector as King of Bohemia. When Frederick forced the city to capitulate, the populace turned against the Jews, and a massacre was averted only by the appearance of General Harrach with a detachment of soldiers. But the Jews did not escape the danger entirely. 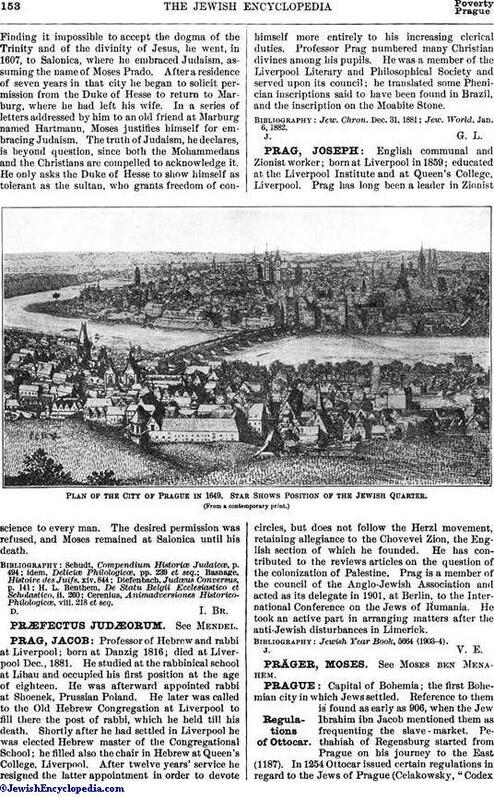 For when Frederick granted freedom to the nobility, the magistrates, and the university, he took a similar attitude toward the Jews, even ordering the soldiers to restore to the Jews everything they had taken from them; and on account of this favorable attitude the citizens of Prague suspected the Jews of treachery, and after the departure of the Prussians the ghetto was plundered. The turmoil lasted for thirty hours, and the Jews who had saved themselves were seized and branded under the arm, in order to make them reveal their hidden treasures. On Dec. 18, 1744, Maria Theresa issued a decree to the effect that all Jews in Prague and the rest of Bohemia should leave the country within five weeks. This decree was promulgated in the ghetto and the synagogues. After the expulsion the Jews were permitted to return to Prague by day for the purpose of collecting their debts. The primator Frankel was held to be chiefly responsible for this decree, because at the time of the wars he had won the good-will of the Prussians and Bavarians by gifts of money. The inhabitants of the ghetto, who numbered at that time 10,000 persons, presented a petition to defer the date of the expulsion on account of the severity of the winter weather. As the stadthalter Kolovrat expressed himself in favor of this petition, the date was set for the end of the February following, and was subsequently postponed another month. The Jews left the ghetto on March 31, and they were not permitted to return, in spite of the intercession of foreign princes. Even the petition submitted by the stadthalter to permit 300 Jewish families to return was refused. But after the ghetto had become deserted, and the people began to tear down and carry away portions of the houses, 301 families received permission to live there, instead of the 50 who had been allowed to return as a result of a new petition (Sept., 1748). A new community was founded; and a tax of 204,000 gulden was imposed, to be increased at the rate of 1,000 gulden a year after five years. 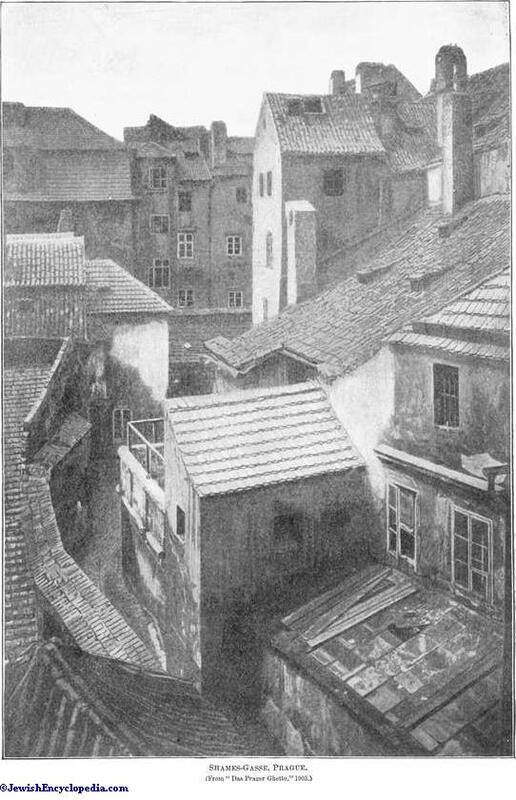 In 1754 a large part of the ghetto was destroyed by fire; but it did not materially affect the Jews, and several stone houses were built immediately after. The ghetto received a special magistrate in 1784. In 1788 two Jews graduated as physicians from the University of Prague—the first to receive this distinction. In 1790 another Jew received the degree of doctor of law. The old cemetery in the ghetto was closed in 1787. Two years later the number of Jewish families living in Prague was again restricted, and only the eldest son in each family was permitted to marry. No foreign Jew was permitted to move into the city until a vacancy had been created by death, and unless he possessed at least 20,000 gulden. The ghetto was called Josefstadt, in honor of Emperor Joseph II. But in 1848-1849, when the equality of all citizens, irrespective of creed, was proclaimed, the Jewish community, whichthen numbered 8,542 persons, was made a part of the city; in 1850 the Josefstadt ceased to be a township, and since then the Jewish town hall has been used for congregational offices. The age of the Prague cemetery can not now be definitely determined, as the oldest tombstones were destroyed in the massacre of 1389. The first decree referring to the cemetery dates from the year 1254, and was promulgated by Przemysl II., who decreed that the Jewish cemetery should not be damaged or desecrated. Similar decrees referring to Prague were issued by Charles IV., Wenceslaus IV., and Ladislaus. According to the historian Tomek of Prague, the greater part of the ground covered by this cemetery was in the beginning of the fifteenth century laid out in gardens belonging to Christians. 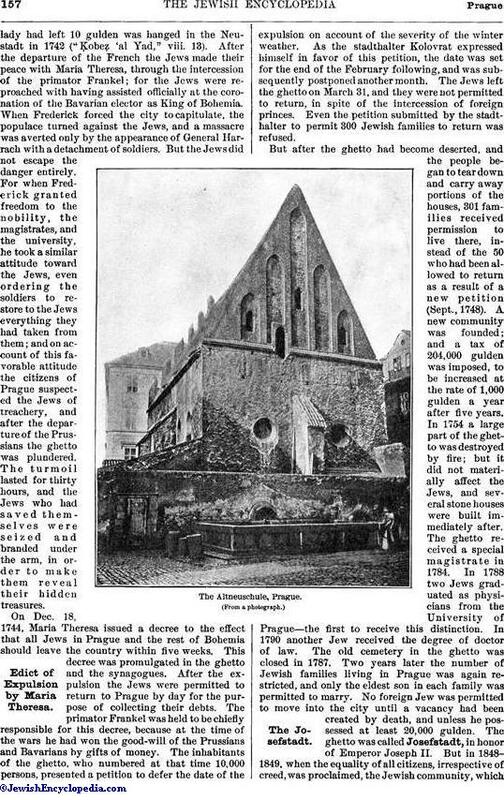 Down to the time of the Hussite wars the Jews are said to have had another cemetery, called the Judengarten, behind the walls of the Altstadt, between Brenntengasse and Breitengasse; it was destroyed by Ladislaus in 1478. 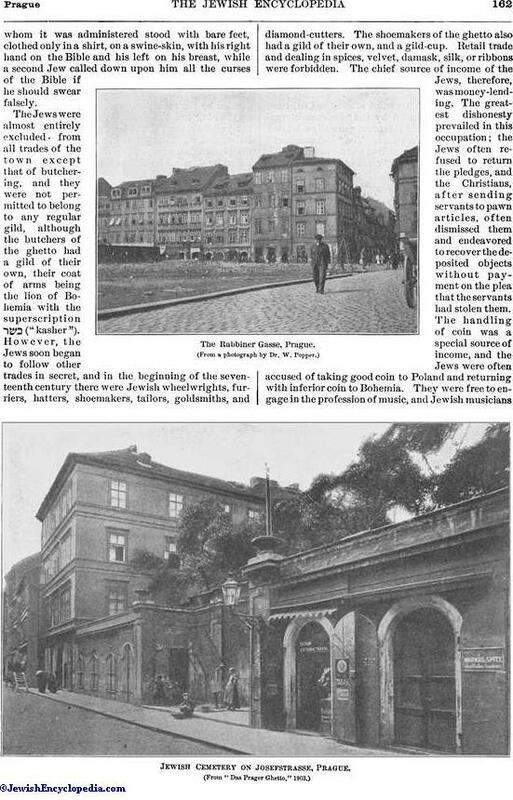 Jews from abroad seem to have been buried in the latter cemetery, and Jews of Prague in the former, according to a decree issued by Przemysl Ottocar II. (1254). The Prague cemetery was desecrated in 1389, and again in 1744 after the departure of the Croatians. The most noteworthy tombs in this cemetery are those of the following: Abigdor b. Isaac Ḳara (d. 1439); the physician Gedaliah b. Solomon (d. 1486); Mordecai b. Ẓemaḥ ha-Kohen (d. 1591); Mordecai Meisel (d. 1601); Judah Löw ben Bezaleel (d. 1609); Hendel, daughter of Eberl Gronim and wife of Jacob Bassevi (d. 1628; this tomb is of white marble, with an escutcheon—the lion of Bohemia and three stars); Joseph Solomon Delmedigo (d. 1655); Simon Wolf Frankel Spira (d. 1679). Special parts of the cemetery were reserved for the several gilds, as those of the butchers, tailors, shoemakers, and musicians. On most of the tombstones there are symbolical signs: two hands with spread fingers for a kohen; a ewer, with or without basin, for a Levite; a grape for an ordinary Israelite. A female figure is the symbol for a virgin, and a similar figure, with a rose in the raised left hand, for a virgin bride. There are also figures emblematic of the name of the family to which the tomb belongs, as a lion, wolf, or some flower. Czech names also are found there, as Čech, Černa, Mara, Vlk, and Sladka. While the cemetery was in use, passing visitors laid pebbles upon the graves of famous persons, so that gradually mounds were formed; visitors also left money on the graves of their relatives, as alms for the poor who were too proud to beg. In the eighteenth century buildings surrounded the cemetery on all sides so that it could not be enlarged; in the Josefstrasse it has reached the level of the second stories of the houses. In 1787 it was closed by order of Joseph II. The oldest constitution of the ḥebra ḳaddisha is of the year 1562. One of the abuses it was designed to remedy was the blackmail extorted by the hospital watchmen, who kept the corpses unburied till their claims were satisfied. A fund was established to which the relatives of the deceased contributed according to their means. Any balance was to be devoted to the extension of the cemetery, to the assistance of other communities, or to providing fuel for the poor at Passover and Tabernacles. 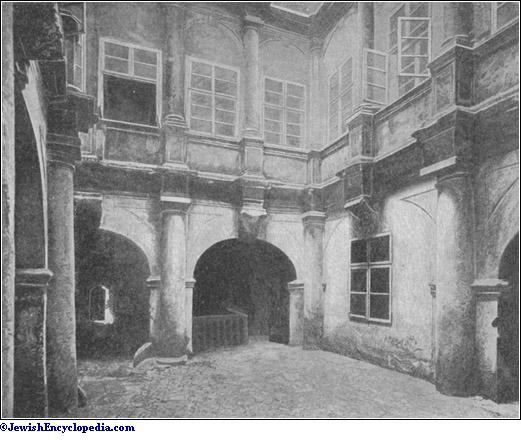 Interior of the Altneuschule, Prague. 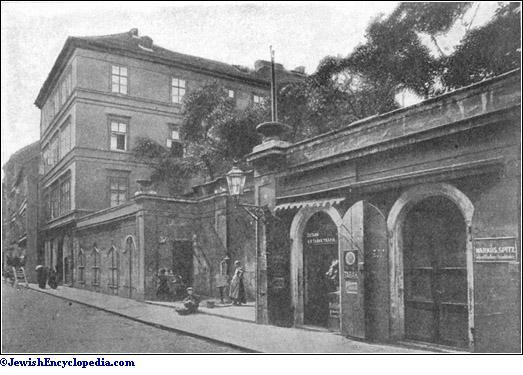 The oldest synagogue is the Altneuschule, near the entrance to the cemetery. It is difficult to determine the date of the building, since its builders did not follow any certain style. Nine steps lead from the street into a dark vestibule, from which doors open into a square nave, with black wallsand small Gothic windows. In the center of the synagogue there are two rows of pillars running from east to west, hindering the view of the Ark. Within the synagogue proper there is no space reserved for women; they have access, however, to an outer room. The framework of the roof, the gable, and the party wall date from the Middle Ages. On the almemar there is a scarlet flag bearing a "magen Dawid" and a Swedish hat, the latter given as an escutcheon by Ferdinand II. in recognition of the services of the Jews in the defense of Prague against the Swedes. The flag was presented to the Jews by Charles IV. This synagogue was the only building spared when the ghetto and the "Tandelmarkt" were plundered (Nov. 27-29, 1744). During the conflagration of 1754 the flames reached the northern side, but were extinguished by the Jews at the peril of their lives. 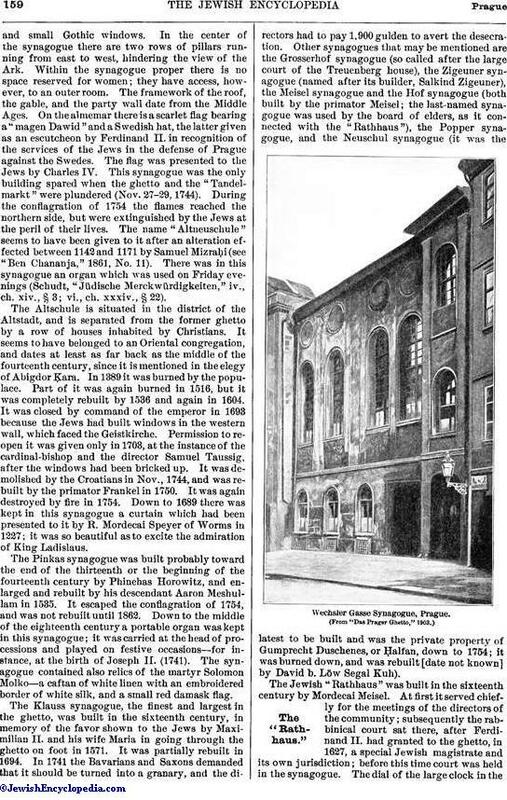 The name "Altneuschule" seems to have been given to it after an alteration effected between 1142 and 1171 by Samuel Mizraḥi (see "Ben Chananja," 1861, No. 11). There was in this synagogue an organ which was used on Friday evenings (Schudt, "Jüdische Merckwürdigkeiten," iv., ch. xiv., § 3; vi., ch. xxxiv., § 22). The Altschule is situated in the district of the Altstadt, and is separated from the former ghetto by a row of houses inhabited by Christians. It seems to have belonged to an Oriental congregation, and dates at least as far back as the middle of the fourteenth century, since it is mentioned in the elegy of Abigdor Ḳara. In 1389 it was burned by the populace. Part of it was again burned in 1516, but it was completely rebuilt by 1536 and again in 1604. It was closed by command of the emperor in 1693 because the Jews had built windows in the western wall, which faced the Geistkirche. Permission to reopen it was given only in 1703, at the instance of the cardinal-bishop and the director Samuel Taussig, after the windows had been bricked up. It was demolished by the Croatians in Nov., 1744, and was rebuilt by the primator Frankel in 1750. It was again destroyed by fire in 1754. Down to 1689 there was kept in this synagogue a curtain which had been presented to it by R. Mordecai Speyer of Worms in 1227; it was so beautiful as to excite the admiration of King Ladislaus. The Pinkas synagogue was built probably toward the end of the thirteenth or the beginning of the fourteenth century by Phinehas Horowitz, and enlarged and rebuilt by his descendant Aaron Meshullam in 1535. It escaped the conflagration of 1754, and was not rebuilt until 1862. Down to the middle of the eighteenth century a portable organ was kept in this synagogue; it was carried at the head of processions and played on festive occasions—for instance, at the birth of Joseph II. (1741). 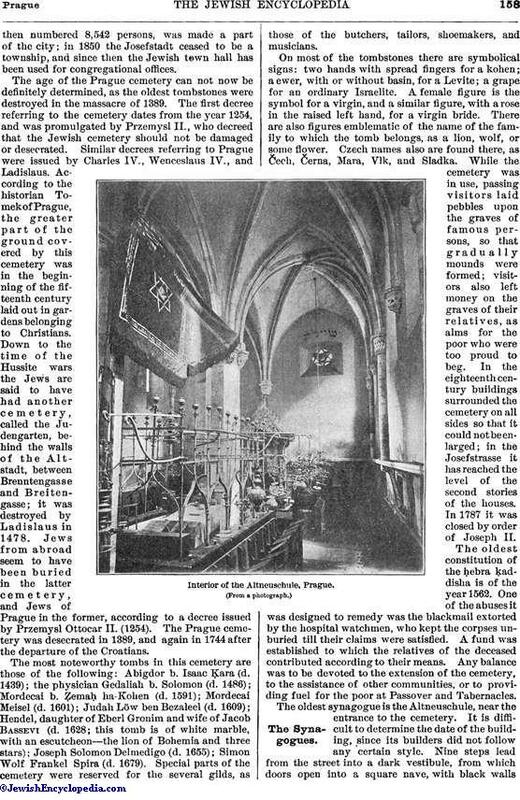 The synagogue contained also relics of the martyr Solomon Molko—a caftan of white linen with an embroidered border of white silk, and a small red damask flag. 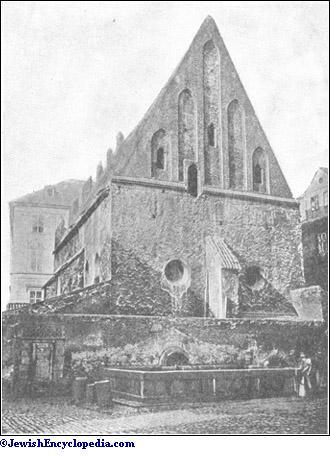 The Klauss synagogue, the finest and largest in the ghetto, was built in the sixteenth century, in memory of the favor shown to the Jews by Maximilian II. and his wife Maria in going through the ghetto on foot in 1571. It was partially rebuilt in 1694. 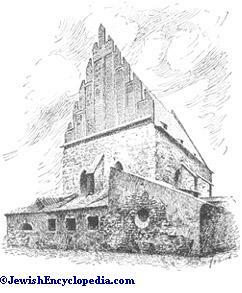 In 1741 the Bavarians and Saxons demanded that it should be turned into a granary, and the directors had to pay 1,900 gulden to avert the desecration. 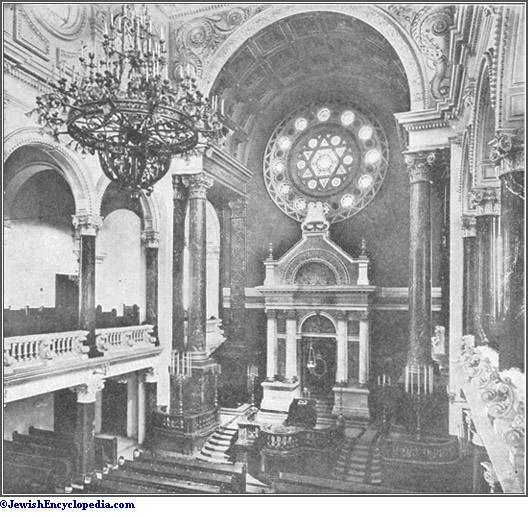 Other synagogues that may be mentioned are the Grosserhof synagogue (so called after the large court of the Treuenberg house), the Zigeuner synagogue (named after its builder, Salkind Zigeuner), the Meisel synagogue and the Hof synagogue (both built by the primator Meisel; the last-named synagogue was used by the board of elders, as it connected with the "Rathhaus"), the Popper synagogue, and the Neuschul synagogue (it was the latest to be built and was the private property of Gumprecht Duschenes, or Ḥalfan, down to 1754; it was burned down, and was rebuilt [date not known] by David b. Löw Segal Kuh). (From "Das Prager Ghetto," 1903. )The "Rathhaus." The Jewish "Rathhaus" was built in the sixteenth century by Mordecai Meisel. At first it served chiefly for the meetings of the directors of the community; subsequently the rabbinical court sat there, after Ferdinand II. had granted to the ghetto, in 1627, a special Jewish magistrate and its own jurisdiction; before this time court was held in the synagogue. The dial of the large clock in thetower is marked in both Hebrew and Arabic figures. The bell was recast in 1745. The "Rathhaus" now serves as a general communal building. The following is a list of the most noteworthy rabbis of Prague: Abigdor b. Isaac Ḳara (-1439); Phinehas b. Jonathan (-1495); Isaac Eisig Margolioth (-1525); Jacob Polak (1525-30); Abraham b. Abigdor (-1542); Judah b. Nathan Sekeln (-1550); Isaac Eisig b. Isaiah of Melnik (1553-83); Löw ben Bezaleel (d. 1609); Solomon Ephraim Lencyz (1604-19); Isaiah ha-Levi Horowitz (1619-21); Moses b. Isaiah Menahem Mendel of Poland (1621-27); Lipmann Yom-Ṭob b. Nathan Heller (1627-29); Simon Wolf Auerbach (first Bohemian "Landesrabbiner"; 1630-31); Joseph b. Abraham Ḳalmanḳes (1631-37); Aaron Simon Spira (1640-79); R. Gabriel Eschkeles (1679-94); David Oppenheim (rabbi and "Landesrabbiner," 1702-36); Moses Isaac b. Jehiel Michel Spira ("Landesrabbiner," 1736-49); Ezekiel b. Judah Löb Landau (1754-93); Solomon Löw Rapoport (1840-67); Dr. Marcus Hirsch (1880-89); Dr. Nathaniel Ehrenfeld (since 1890). 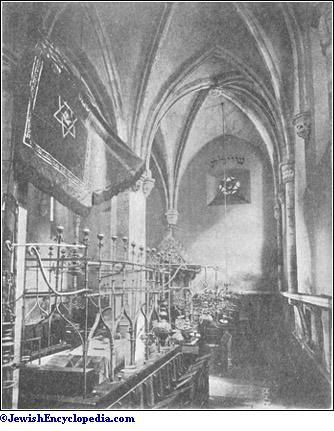 Interior of the Synagogue at Königliche Weinberge, Near Prague. In the fifteenth century there were in the ghetto Jews who knew no other language than Bohemian; and there were also Jews, coming from Spain, who did not know Bohemian; thus there was a community within the community. Difficulties arose in spite of the religious freedom which the Jews of the ghetto enjoyed. In 1537 a Jewish couple is said to have poisoned at the Hradschin a Jewish youth by the name of Juchym because he intended to accept baptism. A Jew is said to have desecrated the stone cross on the bridge, in 1690; therefore a Jew was compelled to inscribe the Tetragrammaton upon it in golden letters, to prevent further desecration. 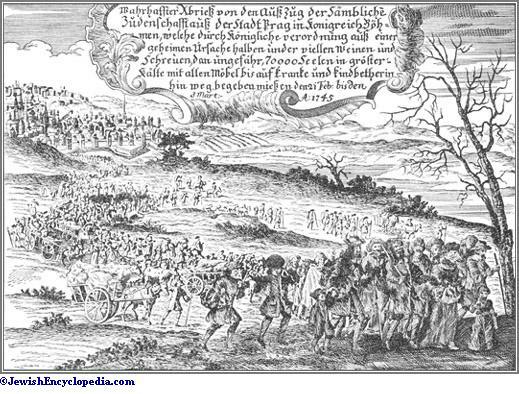 On Feb. 21, 1694, a Jew, with the aid of a certain Kurzhandel, killed his son, Simon Abeles, because the youth desired to accept Christianity. When the deed became known the father hanged himself; his body was thereupon dragged through the city, and his heart was torn out. The son was solemnly buried, while the bellsof seventy churches were rung. In order to make it easier for Jews to accept baptism, a law was passed to the effect that converts could not be disinherited by their families. 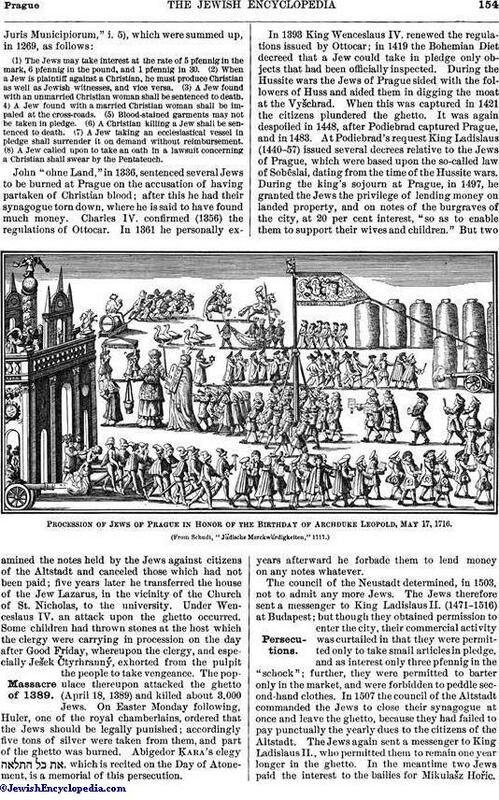 The Jews of Prague were under their own civil jurisdiction, and they enjoyed religious liberty; the "judex Judæorum" was not always a Christian. Civil cases were decided by the "Judenmeistergericht"; the president of this court generally officiated as primator at the same time. The "Judenmeister" and the communal councilors were elected by the Jews. The court generally sat on Sundays, with open doors. In cases relating to money-lending and pledges a certain day of appearance was set, on which the bell of the council-house was rung. If the Christians did not appear on time they forfeited their pledges. In difficult cases the Christians were permitted to interrupt the proceedings and appeal to another court. The court before which cases between Jews were brought was called the "Meisterschaftsgericht." This court had power to impose the following sentences: the minor excommunication (for 8 days); the intermediate excommunication (for 4 months); the major excommunication (for a longer period); imprisonment in the "katzel" (Bohemian, kočečka"). The "Judenmeister" and the elders had charge of the internal affairs of the ghetto and the collection of taxes (on account of which a riot occurred before the council-house in 1503). A. "shammash," a "schulklopfer," a secretary, and a cantor were assigned to the "Meisterschaftsgericht." Ritual questions were decided by the rabbi, whose election was confirmed by the king and the chamber, and who supervised the yeshibah, the Talmud Torah, and printing; the last-named was introduced into Prague as early as the sixteenth century, the first press being established by Gershon ha-Kohen Soncino. Court of the Bassevi House, Prague. In pursuance of a decree of Ferdinand II. the court of the ghetto was divided into two sections—the lower and the higher court. The lower court, sitting every evening, was presided over by the rabbi; only minor cases were brought before it; the higher court, over which the "Landesrabbiner" and an ab bet din presided, sat only for important cases. The highest court was that of appeals. The magistracy was composed of the primator, five justices, six elders, and twelve associates. Since the time of Joseph II. the rabbinate has been composed of the chief rabbi and four associate rabbis. The Jews' oath, which was required only in the Christian court, was taken with special ceremonies: the person towhom it was administered stood with bare feet, clothed only in a shirt, on a swine-skin, with his right hand on the Bible and his left on his breast, while a second Jew called down upon him all the curses of the Bible if he should swear falsely. Jewish Cemetery on Josefstrasse, Prague. The Jews were almost entirely excluded from all trades of the town except that of butchering, and they were not permitted to belong to any regular gild, although the butchers of the ghetto had a gild of their own, their coat of arms being the lion of Bohemia with the superscription ("kasher"). However, the Jews soon began to follow other trades in secret, and in the beginning of the seventeenth century there were Jewish wheelwrights, furriers, hatters, shoemakers, tailors, goldsmiths, and diamond-cutters. The shoemakers of the ghetto also had a gild of their own, and a gild-cup. Retail trade and dealing in spices, velvet, damask, silk, or ribbons were forbidden. The chief source of income of the Jews, therefore, was money-lending. The greatest dishonesty prevailed in this occupation; the Jews often refused to return the pledges, and the Christians, after sending servants to pawn articles, often dismissed them and endeavored to recover the deposited objects without payment on the plea that the servants had stolen them. The handling of coin was a special source of income, and the Jews were often accused of taking good coin to Poland and returning with inferior coin to Bohemia. They were free to engage in the profession of music, and Jewish musicians often played at banquets in the palaces of the nobility. There were some liquor-saloons kept by Jews in the ghetto. In 1650 a decree was issued in which the judges were enjoined to see that working men did not spend Sunday mornings in the saloons. 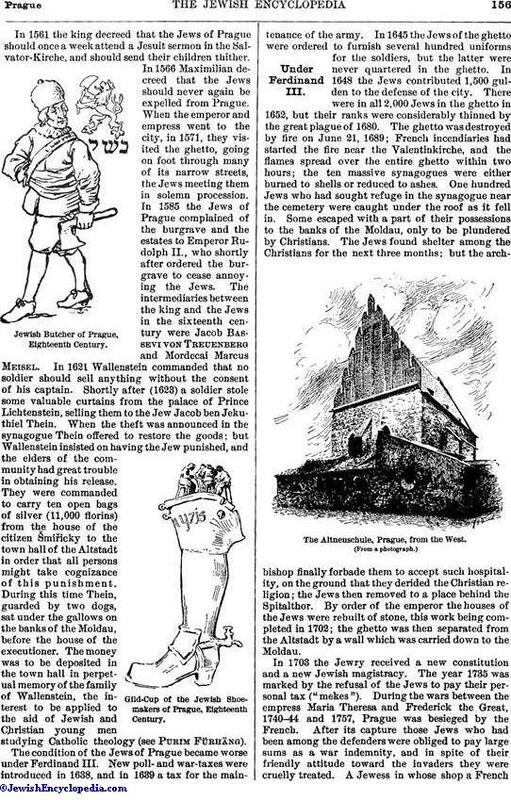 The Jews were forbidden, on pain of death, to call themselves citizens of Prague. Within the ghetto Jews, and especially Jewesses, wore the most costly garments, but outside the ghetto they were required to wear their badges. They had to wear peaked yellow hats; and if they wished to wear round hats, a peak had to be fastened upon the crown. The women were obliged to wear veils fastened above the forehead, and were not permitted to wear collars. In 1748 and 1760 it was decreed that the men should allow the beard to grow, and that strips of yellow cloth should be worn by men upon the left shoulder and by women in the hair. The first proclamation against throwing stones at the Jews is dated 1677. The Jews of the ghetto of Prague were known far and wide as excellent firemen. 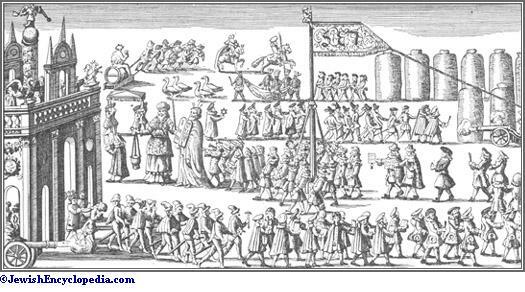 At every siege the so-called "Röhrkasten" was put in charge of 400 Jews, to be ready in case of fire; so at all festivities, as, for instance, at the coronation of Frederick V., of the Palatinate, as King of Bohemia in 1619. Much attention was paid to the education of children. The names of the most prominent Jewish families of Prague are: Eger, Bondi, Gans, Horwitz, Chajes, Tausk, Jaffe, Landau, Meisel, Epstein, Posner, Kuranda, and Karpeles; Hock, Wolfy, Wessely (first Jewish professor in Austria), and M. I. Landau deserve particular mention. The population of Prague is 201,589, of whom about 19,000 are Jews. 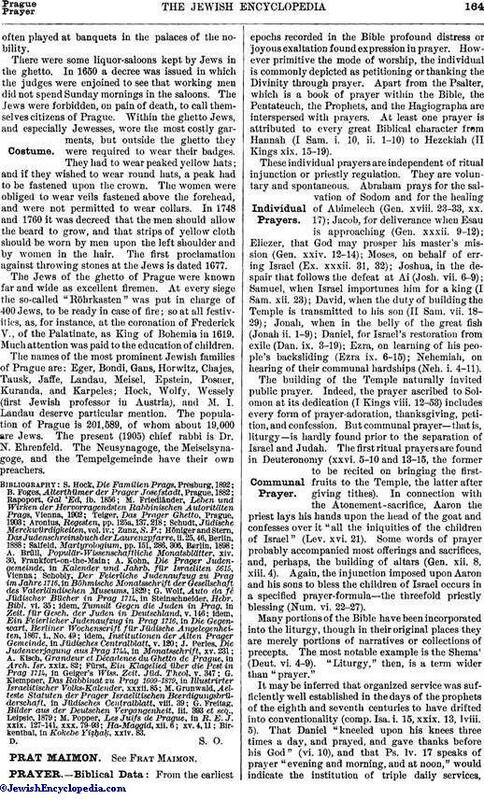 The present (1905) chief rabbi is Dr. N. Ehrenfeld. The Neusynagoge, the Meiselsynagoge, and the Tempelgemeinde have their own preachers. Birkenthal, in Kokebe Yiẓḥaḳ, xxiv. 83.